In the face of a tragic situation, CASA helped a family protect their child and find the best outcome. "We got involved with CASA about four years ago. I lost my daughter, Rylee. She passed away due to child abuse," recalls Helen Thompson on how she and her daughter, Alexis, became involved with the CASA Program. Given the severity of the case, Alexis was temporarily removed from the home to protect her from the situation. Through the frightening and confusing affair, CASA helped the family navigate the legal system. Thanks to the guidance and support of Helen's attorney and the child's guardian ad litem, the judge was convinced the best place for Alexis was to be with her family and the court placed her back at home. "We now understand why it's so important to have a voice or to have someone in that situation to be there to protect you," says Helen. With the help of a CASA volunteer, the Thompsons discovered their nieces needed to get out of a bad situation. "We kept hearing stories about the conditions that these girls were in," recalls Tony. "They were in a bad situation, being taken away from their parents and foster homes." Though the parents said they were doing everything they could to take care of the children, Tony and Rita heard another side of the story. They connected with the girls' CASA volunteer, Kelly, and discovered the truth: the girls weren't getting the care they needed. "We want to do the right things for the girls, and I want to thank Kelly for that," says Rita. "CASAs fight for the children." Inspired by Rita's own experiences as a foster child and Kelly's work, the Thompsons decided to adopt their four nieces. "We knew that we were blessed and in a position where we could actually step up and help out in some way to get the girls in a stable environment," says Tony. An experience with a CASA volunteer inspired Connie to make a difference. "I decided to become a CASA because one came to my classroom when I was teaching, and she sat and she listened. Because of how she let me explain the situation with the child, he got services, he went to live with his grandmother, he got counseling, and he started to do better," says Connie Beal on her encounter with a CASA volunteer. "I said, 'Maybe when I retire, I can do that, too.' And so I've done that." Since becoming a CASA volunteer, Connie has found the experience to be very satisfying and fulfilling. She's learned how to truly listen, help parents do what is best for their children, and make a difference. "One child I've seen and had since second grade, I'm going to stay with her until she graduates high school," says Connie. "There was a period where she was very, very... just upheaval, but she has settled down now. She is going to be able to fulfill her goals. I'm really proud of her." A CASA volunteer shares a moving story about an “unadoptable” boy she helped find a home. Dena Zwingle, Volunteer for CASA of San Mateo County, California, shares a heartwarming story about a foster child finding a loving, permanent home. After suffering and witnessing abuse through his life, Dillon had been labeled "unadoptable" by some. For Dena, that wasn't acceptable. "All they need is somebody that loves them and cares about them and will be there for them," says Dena. "He's just a wonderful kid. He deserves to have a wonderful life." Eventually, Dillon was adopted, and he's found a family to give him the love he deserves. This is a story of a CASA volunteer turning hurt, into hope. “I thought I’d share a CASA experience with you that I found interesting. I am advocating for five-year-old twins whose father is out of the picture and whose mother has a mix of issues from drug use to domestic violence from her boyfriend. These little girls are the prettiest little darlings. They also have a one-year-old sister whose father is incarcerated. I went to visit them at their relative placement home the other day. It was a nice day and they were outside riding bikes when I arrived. They had some sidewalk chalk so I had them lie down on the driveway and hold hands. I traced both of them. I then gave chalk to each of them and told them to fill in the details. The very first thing they did was draw hearts on their chests . . . then they filled in their noses, eyes, etc. 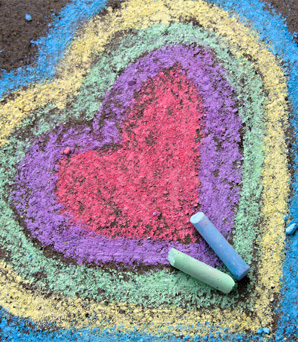 I was astonished that they drew hearts as most children draw the obvious details that we see.